The idea that art should only be observed from galleries is outdated and just plain wrong. If you’ve ever been exposed to quality street art, you know that the city is actually the best canvas for creativity to soar. There will always be a conversation about what constitutes street art and what’s considered graffiti. 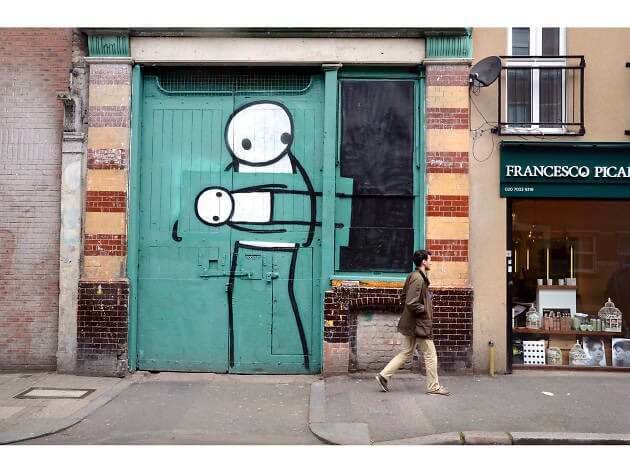 Hopefully, these works of magnificent street art will help guide that conversation in a positive way. To me, it’s pretty simple. 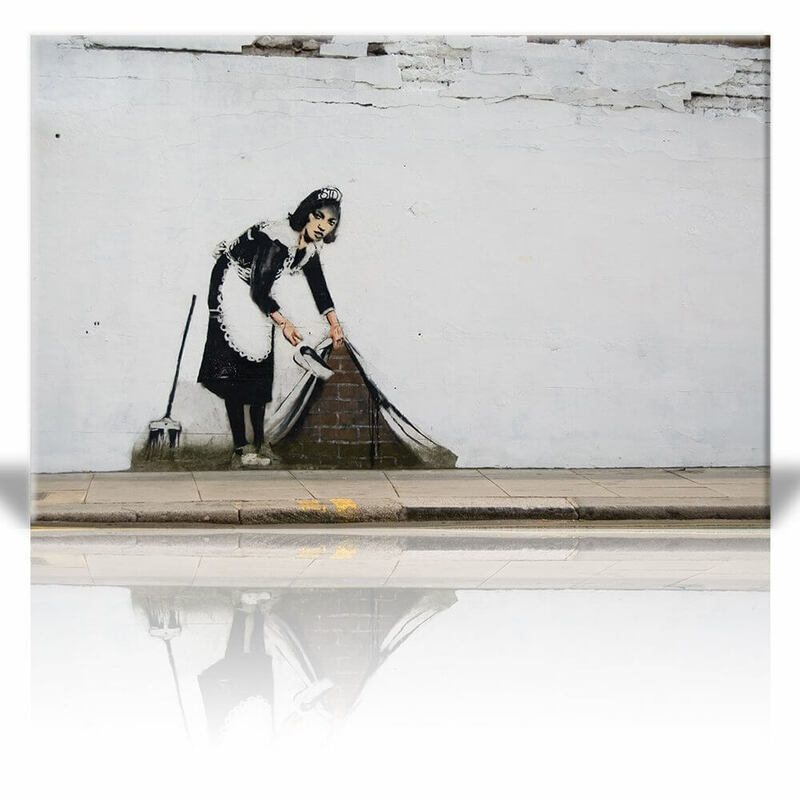 A true artist can give new life and definition to a wall or building, while a vandal can make it look run-down and uninviting. A true street artist has a creative vision and message, while a graffiti artist is probably just trying to sell you their new mixtape or tag a building for their gang. 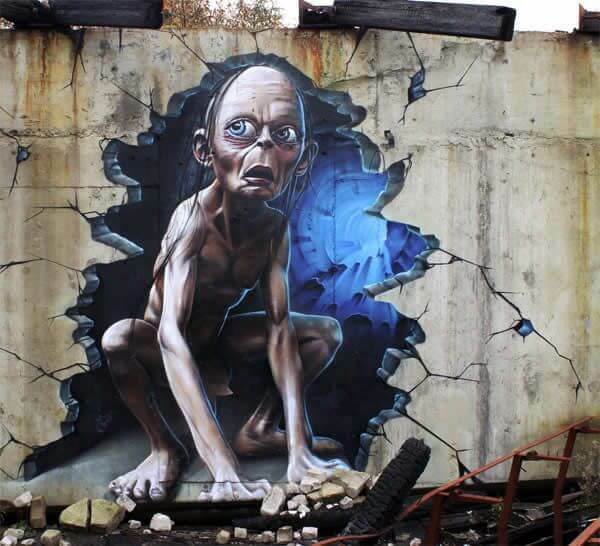 Here are some of the best pieces of street art from around the world. Wait until you see the horrible tragedy that took SpongeBob Square Pants away from us! 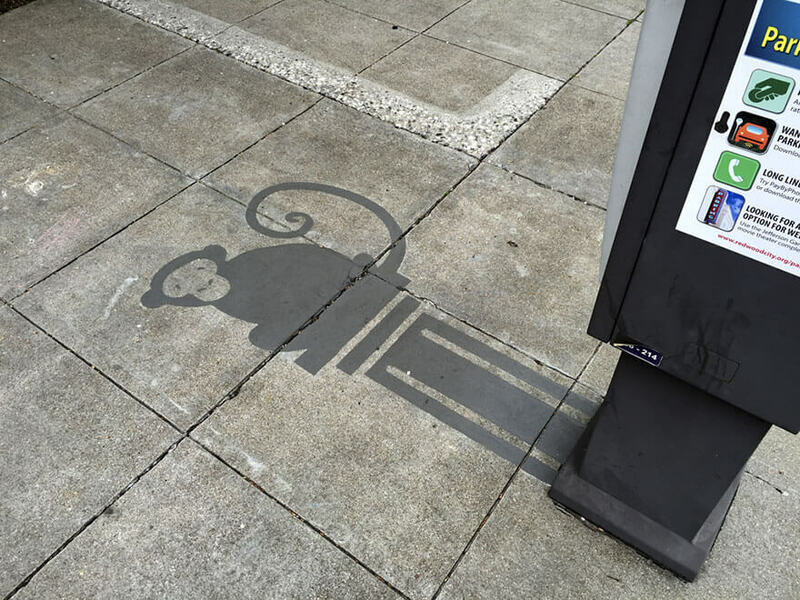 Damon Belanger is a street art mastermind who takes everyday objects that you find on the street and gives them a shadow that makes them insanely cooler. Belanger is giving these inanimate objects a new life that allows something like, for example, a parking meter to become a sweet Tibetan monkey on a pillar. I mean, who doesn’t like monkeys? He’s really doing God’s work here and should receive some sort of street art Nobel Peace Prize. 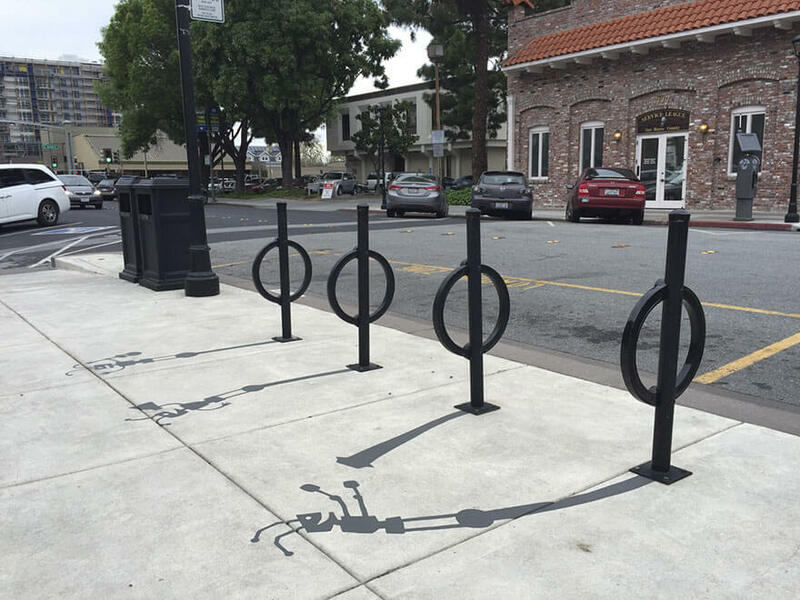 My guess is that these bike racks lived fairly normal lives for a street post. That was until Damon came around and signed them to a shady record deal that turned their otherwise standstill existence into one that resembles Mick Jagger’s. After getting a makeover that transformed them into the most iconic robo-band around, they have unfortunately let their ‘celebrity’ get the best of them and have become very narcissistic. They now only allow certain bike brands to lean against them. Fame changes people. It’s a story as old as time. This is all too relatable. How many times did you want to pick up the breakfast barstool and launch it, ‘Hulk Style,’ at the big yellow school bus? How about the unaccountable amount of tears that stained the kitchen floor with more than just cooking grease? My guess is that this happens every morning all over the world. 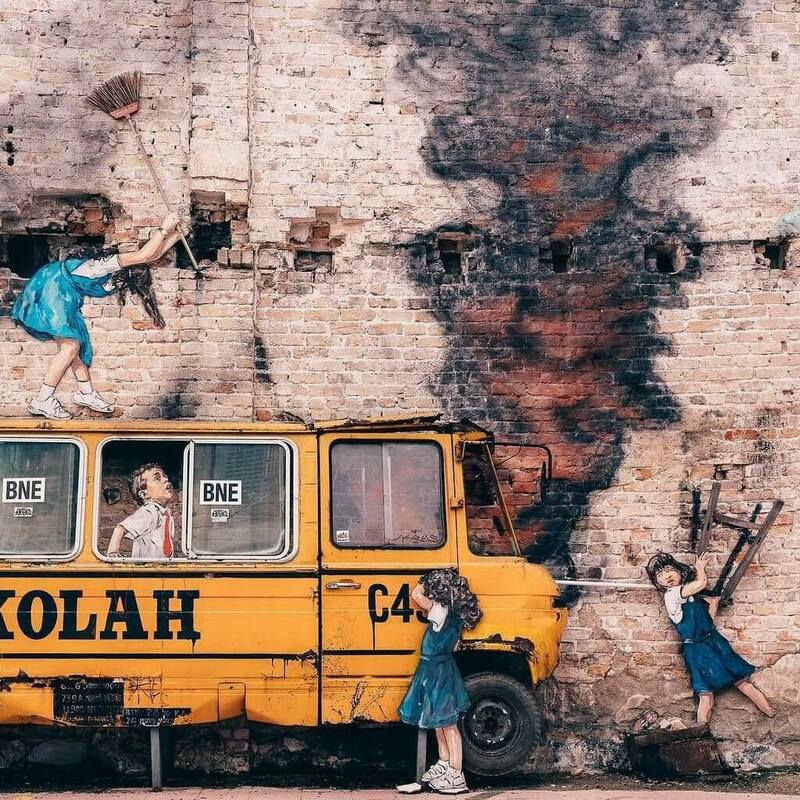 This beautiful piece of street art is found in Kuala Lumpur, Malaysia, and gives us some serious nostalgia. When nature meets art, sparks fly. One artist seamlessly meshed the two and it’s incredible. I don’t care what anyone says, Spiderman is the OG wearer of morph suits, no ifs, ands, or buts. He made them cool, end of story. Here’s something you probably didn’t know about him that may actually change your perspective on who he really is. He has fallen in love with four different women throughout his time as a superhero. 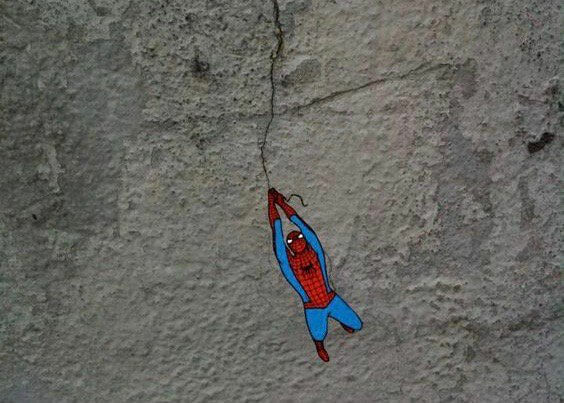 It looks like Spidey may have some serious commitment issues, ruh-roh (Scooby Doo voice). Peter Parker’s dating life seems to be as high-flying and sticky as his battles with the Green Goblin. This artwork pulls off being beautifully captivating while also being mildly concerning and creepy – for any street art fanatics out there, you know this is the recipe for greatness. Even though this is really cool, I can’t shake the feeling that I’m being watched. The eye moves with you across the room! 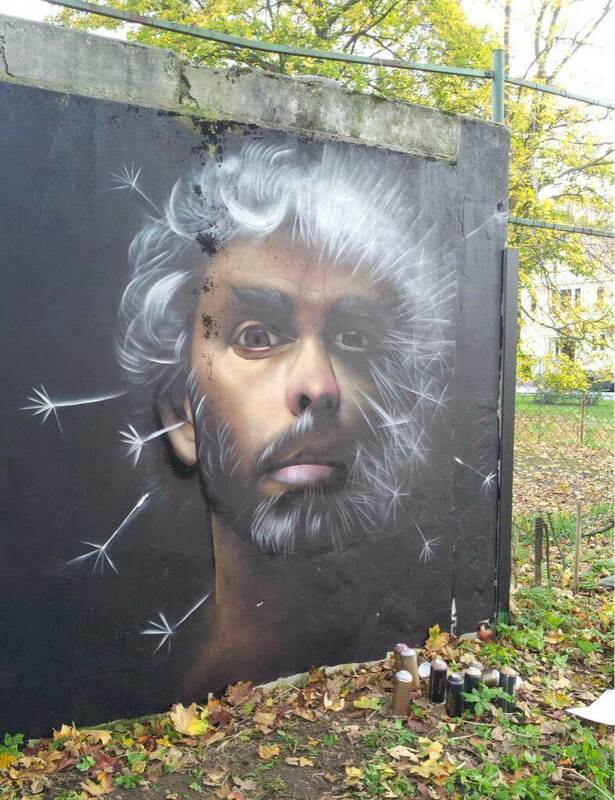 One key ingredient to street art is taking the surroundings you are given and use your imagination to incorporate the natural environment into exactly what you are creating — just like this street artist did with their finished product. 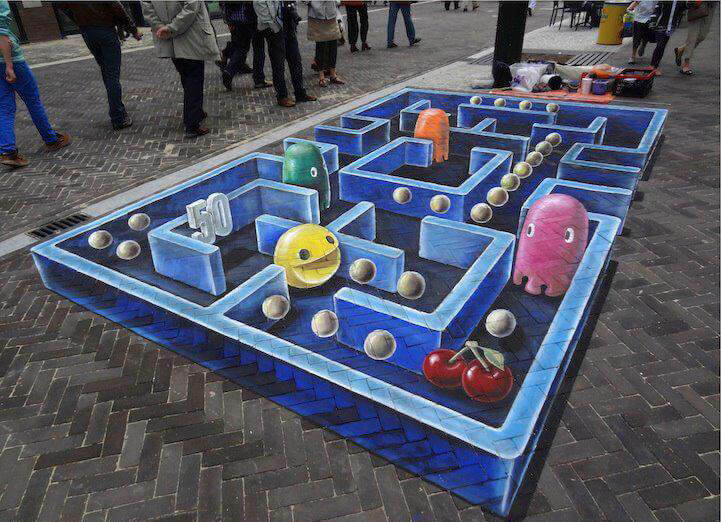 If you’ve ever played Pac-Man, just wait till you see what one street artist came up with. At first glance, this street art looks fairly bland, like getting a “Live, Laugh, Love” tattoo on your forearm. 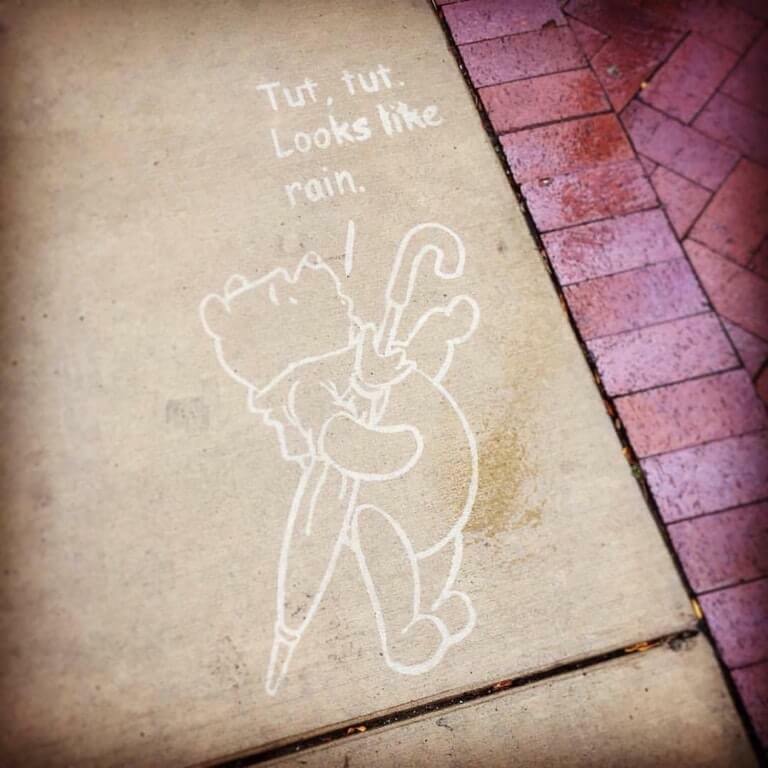 What makes this cute outline of Winnie the Pooh impressive is that it only appears when it rains. There really is nothing better than the sombering presence of Winnie during a rain shower. I’m a big fan of rainy days, what people actually want to get caught in the rain? They’re no Pina Colada’s, after all (I’m so sorry). That being said, seeing this on my walk home would definitely put a smile on my face. You know the litter has gotten out of hand in New York City when the murals have to start picking up garbage on the sidewalks. You can’t just sweep this type of environmental sewage “under the rug” like a bad case of McDonald’s running out of the Szechuan sauce they promised to Rick & Morty fans. There is a surprising amount of street artwork with socially responsible meanings attached to them and they’re absolutely fascinating. This is another great example of using an old building and some paint to transform the surroundings of a city. Our next piece of street art will have you chasing ghosts. Pac-Man is ridiculously addicting and still remains one of the most popular arcade games of all time. It was one of the first video games that would genuinely make your heartbeat increase to a borderline unhealthy rate. I still see Inky, Pinky, and Blinky in my nightmares. The game did help my fruit consumption though because it made cherries very appealing. This was the starting point to my cherry obsession that I am still a slave to after all these years. 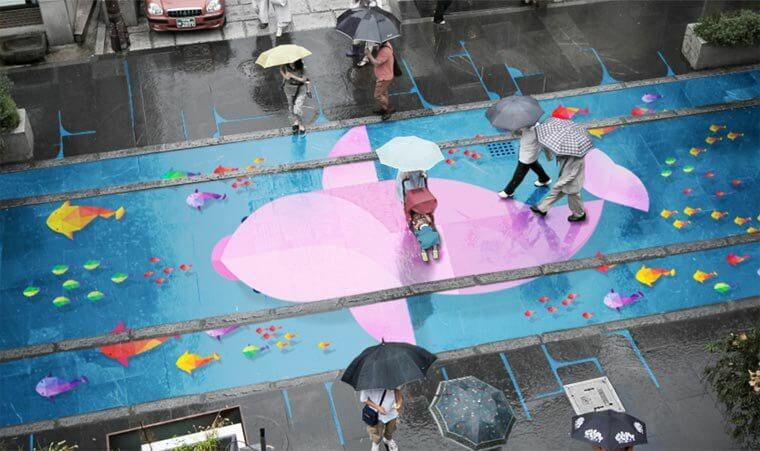 One South Korean street artist came up with an idea that brightens up everyone’s day during the dreaded monsoon season. Is there a better way to warn kids to look both ways before crossing the street than to splatter their childhood hero on the pavement? No. 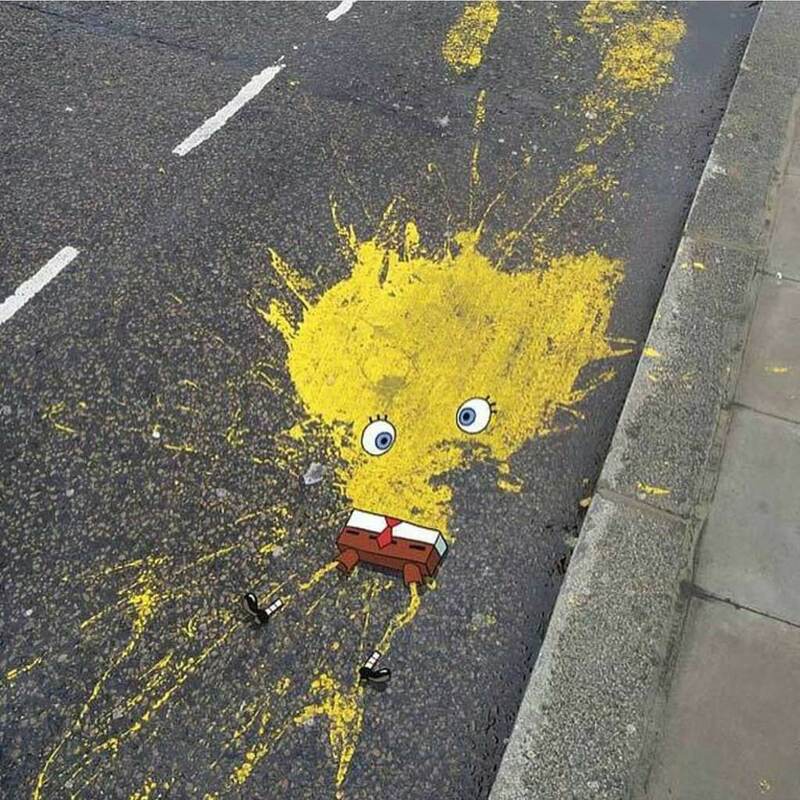 Should there be a thorough investigation into who crushed Spongebob in the BIKE LANE and smeared his insides everywhere? Yes. Yes, there should be. This scare tactic is something that will burn into the minds of kids everywhere to never cross the road without at first glancing in both directions. Art is always at its best when it can teach us while we learn. Also, why was Sponge Bob Square Pants walking around outside without his water-filled helmet on — perhaps this was a suicide mission. I’m thinking that this piece of work is supposed to be a reality check for any Android users who think their cameras are better quality than an iPhone. The pixellated water really does a great job of perfectly encapsulating what every picture looks like when it’s taken by that potato phone. The contrast is real guys, and yes, I can hear a few of you yelling at me already with counter-arguments about its hardware diversity, but that still doesn’t erase the fact that my first flip phone has a better camera. Period. Monsoon season in South Korea is a dreary time that drowns out any hope of vibrant colors that are proven to boost people’s overall happiness. This street art sets out to battle against those cloudy days by allowing it’s bright blues, oranges, pinks, and greens to shine through when it rains. Who could have a frown on their face looking down and seeing those happy little fish swimming down the street? 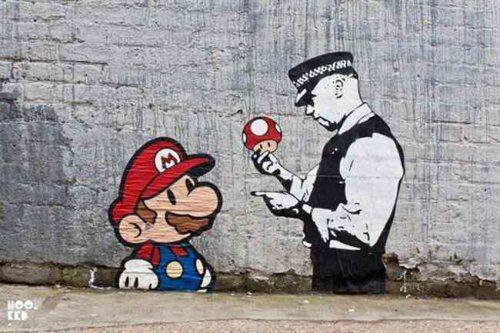 If you’re a Mario fan you’ll love how he was incorporated into an amazing piece of street art. This is the most real-to-life Mcdonald’s advertisement I have ever seen. Let’s be honest, we all knew that Ronald Mcdonald only put up a front that he was just a happy-go-lucky clown that has never had a bad day. In reality, he’s just like you and me after crushing a Big Mac with extra pickles while shoving a minimum of nine fries in your mouth at the same time. This actually makes me want to go to Mcdonald’s more now that I know Ronnie immediately b-lines it to the nearest alley to “relieve” himself when he gets out of the ball pit in the Play Place. Anything to do with Mario is a hit in my eyes. 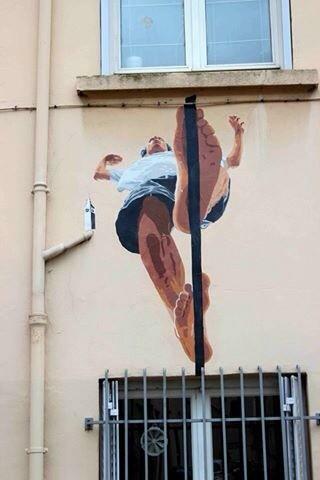 This Italian stallion has become a generational figure that deserves to have street art on every wall. Why? Because he’s hands down the most dynamic character in the world. He’s basically a NASCAR driver, MMA fighter, PGA golfer, Survivor winner, and tennis star all built into one little overall-wearing, mustache-wielding super cartoon. I don’t think that police officer knows who he’s scolding here because Mario has fists that have proven to punch through brick walls. Sometimes simple murals with powerful messages make for the best artwork, and one piece coming up perfectly exemplifies that. 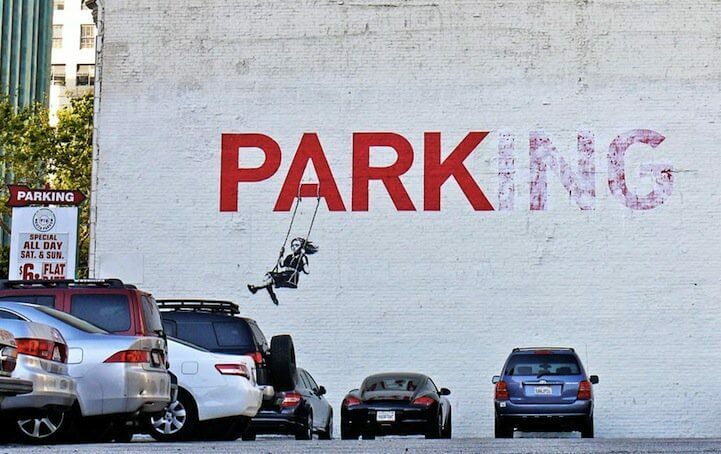 This is a brilliantly creative idea that attempts to turn a boring old parking lot sign into an illusion of a little girl swinging and having fun. Here’s the problem – parking lots are not fun. Don’t believe me? Here are the stats. The most common place for a fleet vehicle to get into an accident is in a parking lot. I don’t care if you’re a Fox News correspondent, you’re not going to be able to spin this stat into something that makes parking lots fun. This is not coming from someone who has had a few (2) incidents in a public lot, I swear-ish. 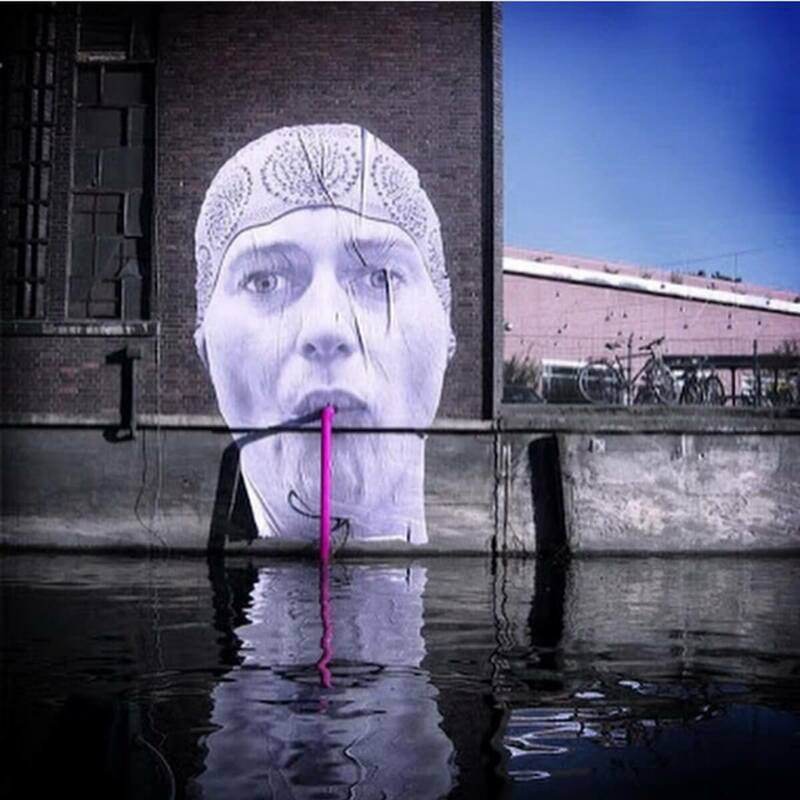 I’m using this mural of someone sipping water to broadcast a public service announcement. You’re dehydrated and it’s affecting every part of you’re life. A majority of people are chronically dehydrated and that’s a fact, I think. I’m not a doctor but I spend a lot of time on the internet so that has to count for something… right Dr. Google? I do know that as soon as you start to feel thirsty, it means you actually needed water a long time before that feeling arose. 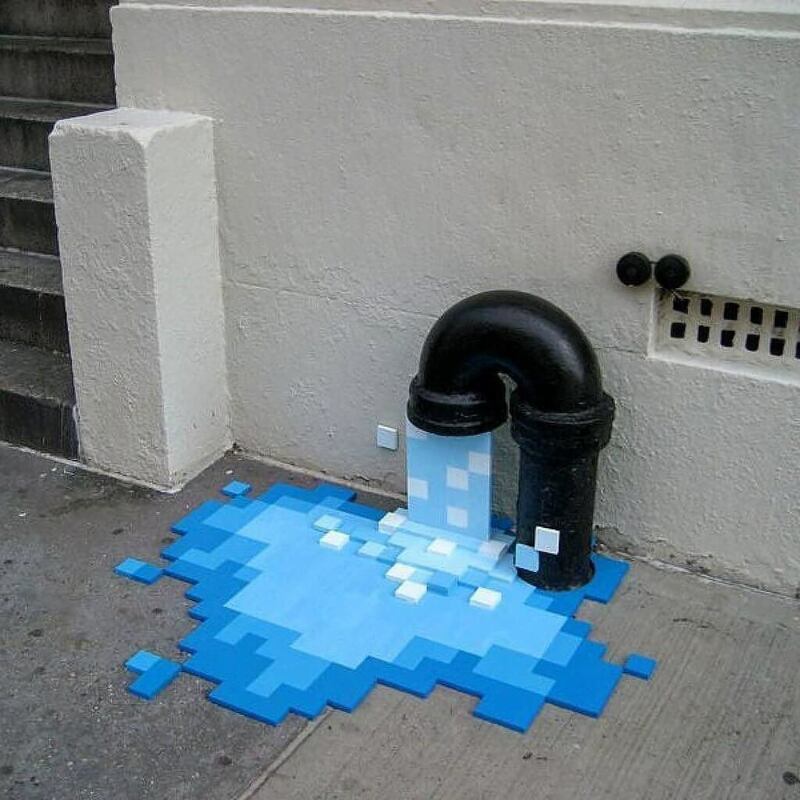 This street art is probably more hydrated than you are right now, which should be a wake-up call to go grab a glass of water. Go now. Please. This is relatable on so many different levels. Stick people with non-stick person torsos have grown in popularity and have shone through with some of the most iconic art pieces I have ever laid eyes on. Selfishly, I’m thinking back to grade four when I drew my first stick person World War, which would prove to be a defining point in my life. Not exactly sure how but there was certainly some definition there that makes me always think of that war. Anyways, this “never leave a man behind” attitude is something we need a lot more of right now. I respect the simplicity of the image which helps translate the message it’s trying to portray. There’s so much happening here that makes me incredibly impressed, confused, and nauseous all in one glance. Ironically, those are the exact same emotions I feel (in that order) when I tee up my ball on the first tee blocks, only to hit a ball four feet in front of me. If you’re like me golf is incredibly frustrating because it makes grown men and women look like they have the motor skills and hand-eye coordination of a newborn baby. 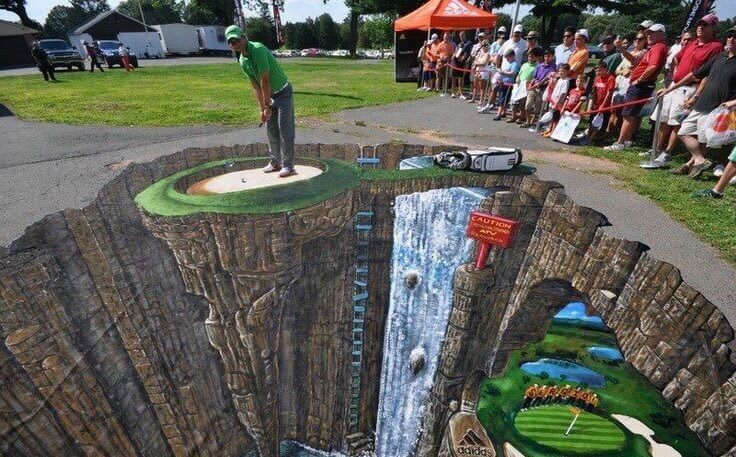 While I might not be great at golf this is one course I would be willing to play just for the thrill of tackling an incredibly scary course. 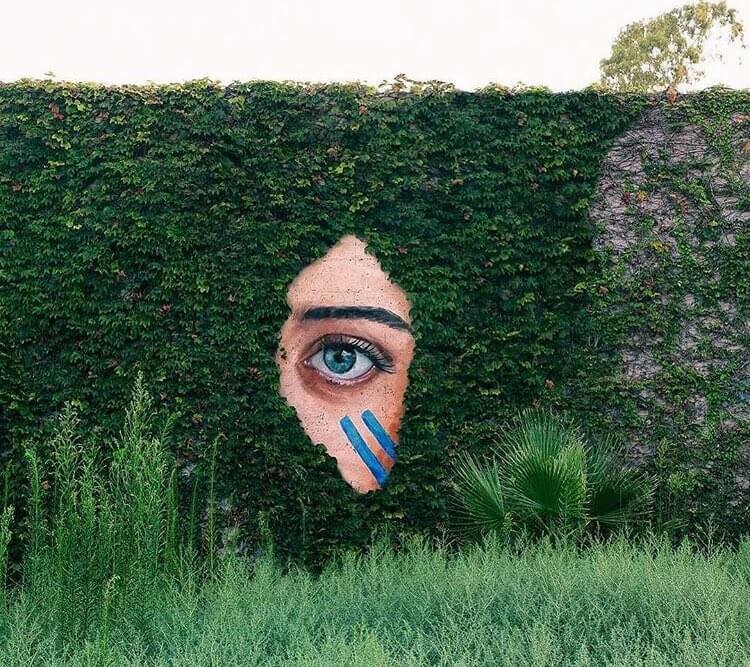 The next street artist managed to bring mother nature right into their outdoor artwork. This is giving me that awful feeling of a pre-sneeze full body jerk just by looking at it. Anyone with environmental allergies gets random flashbacks of those flying dandelions that dive bomb you and basically take away your ability to breathe. It’s no surprise that this guy isn’t overly excited about the fact that instead of balding like the rest of us, his genetics make his hair turn into flying allergy bombs, and I don’t blame him. If I was a superhero this would likely be my seasonal arch-nemesis because I’m just weak enough to let dandelions be my life-destroying kryptonite. 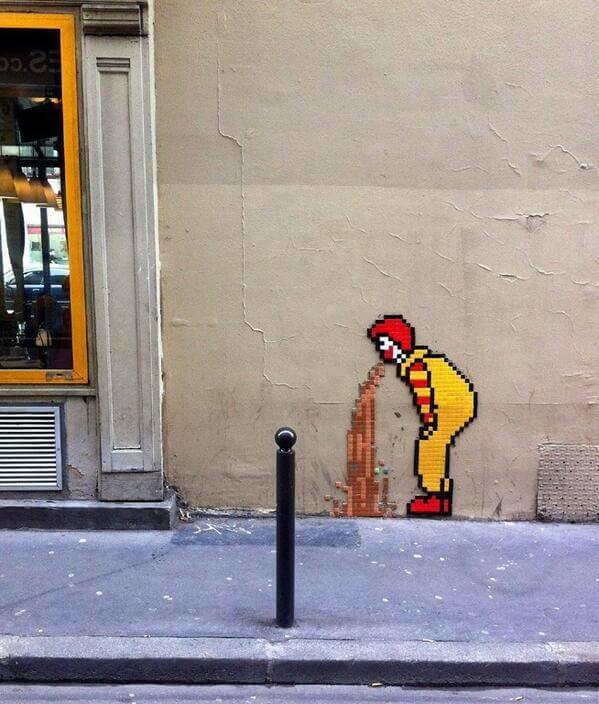 With all that being said, it’s still a beautiful work of street art.